​Emerald ash borer (EAB) is a destructive insect pest that attacks and kills all species of ash trees (Fraxinus genus) native to North America. EAB is native to Asia and has no natural enemies in North America. The adults are small, iridescent green beetles that live outside of trees during the summer months. The larvae are grub or worm-like and live underneath the bark of ash trees. Trees are killed by the tunneling of the larvae under the tree's bark. The first infestation of EAB in Minnesota was discovered in Saint Paul in 2009, though it is believed that it arrived as early as 2004. While EAB spread starts slowly—usually undetected in the upper canopy of ash trees—it reproduces exponentially and advances quickly to kill all of a community’s ash trees, usually within 10-15 years of arrival. Now fourteen years in (2004-2018), EAB in Saint Paul has reached a critical stage. Homeowner's Guide to EAB - check out this page for information to help you decide what to do with the ash tree in your yard. EAB FAQ - click on the link for answers to our most commonly asked questions. City-wide EAB Management Strategies - information about how the City is working to minimize the impacts of EAB. Structured Removal- check here for 2019 plans and timelines. Parkland Ash Tree Management - click here for information on how the City is managing EAB in parks. NEW! 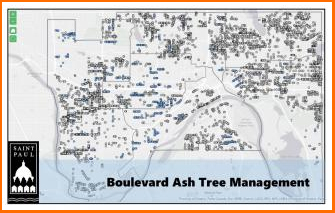 - Boulevard Ash Tree Management Map - view the interactive map to see boulevard ash locations, ash being treated, and ash trees to be removed through structured removal. Emerald ash borer was first discovered in SE Michigan in 2002, but it is thought to have been present since the early 1990's. Since its' arrival to North America, it has spread to numerous states and Canadian provinces. Check the links below for the most up-to-date statewide and nationwide EAB information.